QA Graphics, a leader in the building automation system (BAS) graphic outsourcing industry, continues to stay on top of competition by improving their skills with all day advanced Revit training with IMAGINiT Technologies. This lead our designers to create templates for QA Graphics new floor plan standards. 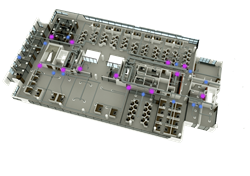 This example pictured is of QA Graphics' Platinum Plus Package that shows a custom floor plan with ductwork, furniture, and high customized details. QA Graphics Drafters took time out of their busy schedule to participate in specialized Revit training with content focused upon aspects used to produce high modeling renders. The training was conducted on site at QA Graphics’ office by a certified instructor from IMAGINiT Technologies. During this on-site course, QA Graphics’ Drafters discussed design process, templates, and improved project set up for easy working and efficiency. Additional focus during the training session included detailed discussion for items such as stairs, curtain walls, massing, and ductwork. Using all the learning tools provided will help QA Graphics Drafters continue to provide the best possible render for their client. The new floor plan templates will make defining the style of floor plan for a client simpler. Choosing the style and the level of detail that is included leads to an overarching better product and understanding on both the client and designer sides. IMAGINiT Technologies - A division of Rand Worldwide, advances the way architects and engineers use 3D technology to design, develop, and manage complex engineering projects. Customers include organizations in the building, infrastructure, manufacturing and facilities management industries looking to gain competitive advantages through technology, professional services, training, and support. Visit http://www.imaginit.com/ to learn more.